2014 did not start on a high note, unless you take that literally in which case the high snowbanks count. As Murphy would have it, the gates were seldom open during the winter months as neither the weather nor the staffing issues allowed. The sheer volume of snow kept the staff continually working overtime trying to keep the city clear of snow and functioning. As winter finally let go its icy grip and ever… so… slowly… turned into the season of glory, the staff continued to be busy beavers getting ready to make the jewel in our crown shine for a king in waiting. 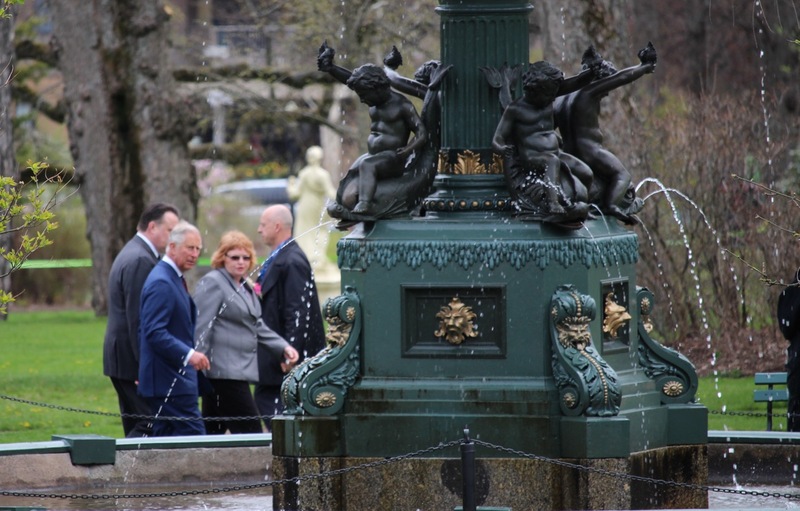 The Royal visit was planned for Victoria Day weekend which took place early this year. Unfortunately our late spring weather meant that our beautiful, usually floriferous Public Gardens, tried in vain to show our horticulture loving Prince a glimpse of its glory. In true Maritime fashion, it was the people who captivated His Royal Highness. They came in droves, and welcomed him with such enthusiasm and warmth that he was clearly enjoying himself and didn’t even seem bothered by the grey and windy day. I suspect from the tan he was sporting that he was recently arrived from much warmer climes. 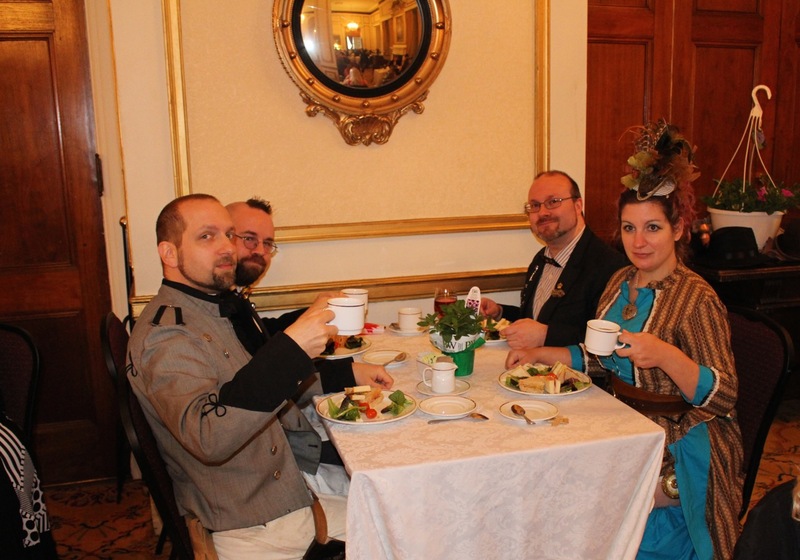 The 2nd annual Friends of the Public Gardens Victoria Day Tea was held (conveniently) on the same afternoon at the beautiful Georgian room of the Lord Nelson Hotel, our generous sponsor. It was once again a sold out event. I was amazed at the amount of effort people put into their costumes and hats. Next year I think we should give prizes away to’ best dressed’ and ‘best hat’. 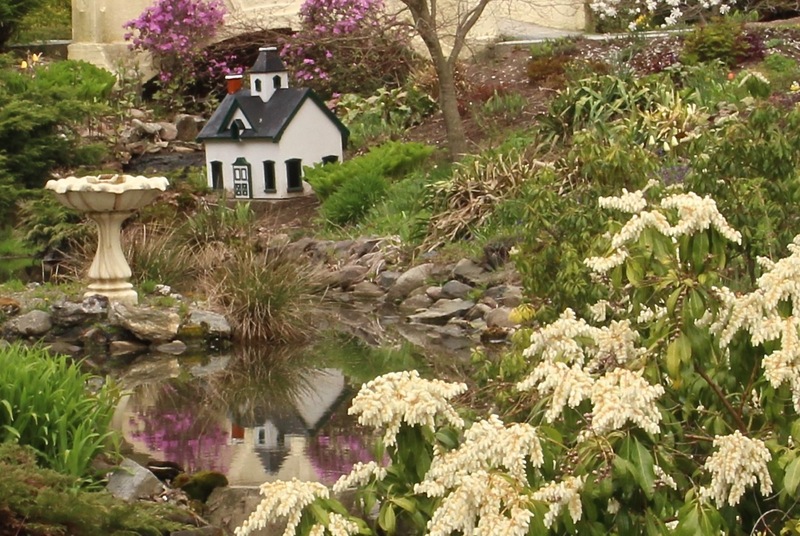 The following weekend the greenhouses on Sackville St. hosted this year’s Open House. 800 people showed up to take a look behind the scenes and pick the gardener’s brains. They probably didn’t mind enjoying the plants, inside a bright and warm structure either. The Titanic model came back this year. It was sorely missed. 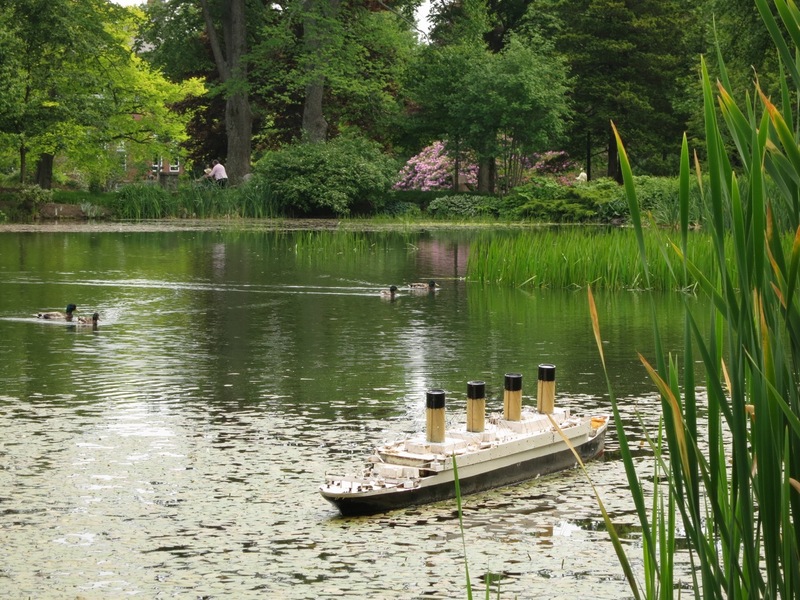 Now if we can figure out how to keep it from going aground on Griffin’s Marsh…..
We lost our champion this year. 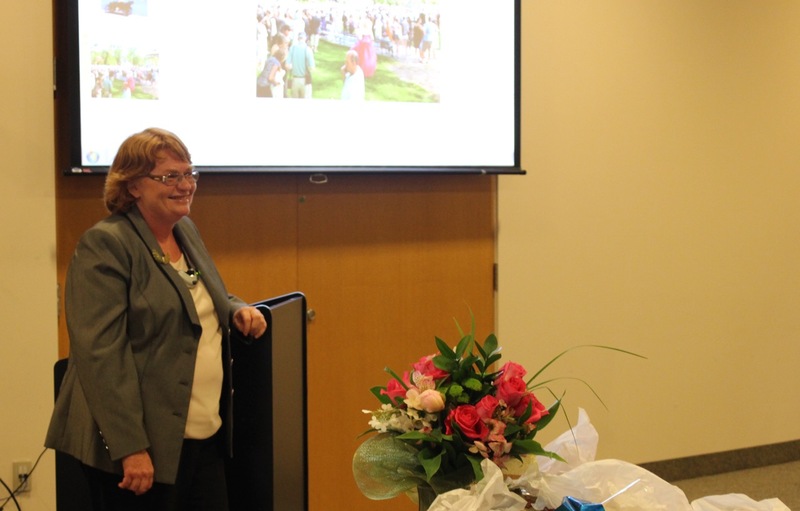 Bev MacPhail, Chief Horticulturist of the Public Gardens started her well deserved retirement. We miss her like crazy. I’m sure so does Heidi Boutilier who has assumed many of Bev’s duties as well as her own. Hopefully she’ll be able to come up for air soon with an announcement regarding Bev’s replacement. 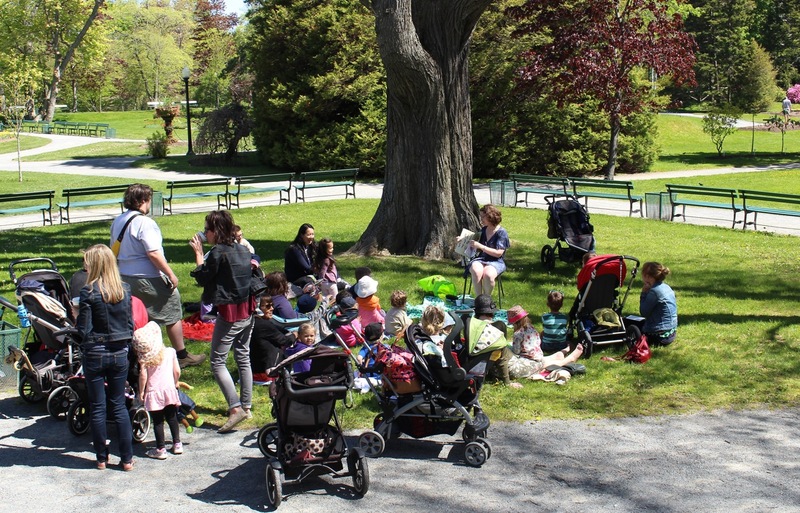 Woozles bookstore once again partnered with the Uncommon Grounds cafe staff to bring our younger visitors another year of Story Time. You’ve got to love sponsors and volunteers. They enrich our lives (and vice-versa I think). Helen MacLean a veteran gardener and fellow member of The Friends of the Public Gardens board, has been working on special projects to increase community involvement at the Gardens. 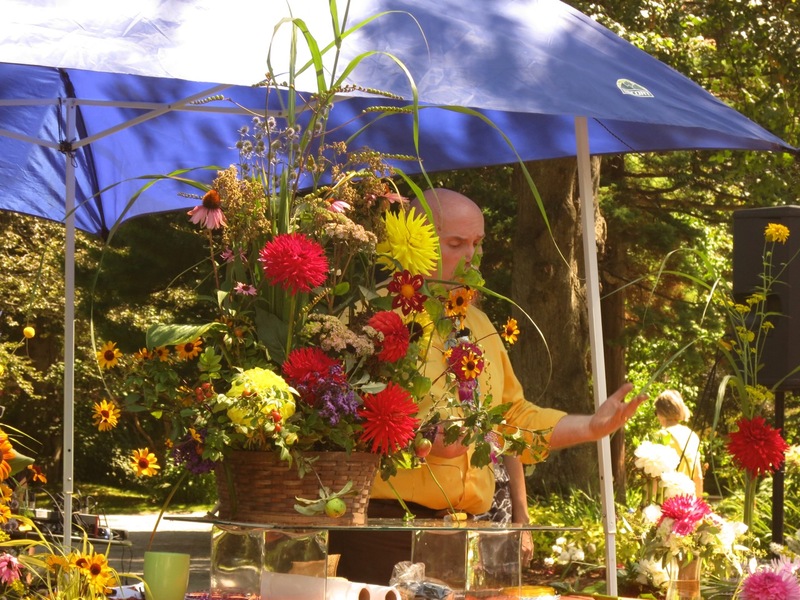 She organized an Ikebana display at the Family Lawn area followed a few days later by a workshop. 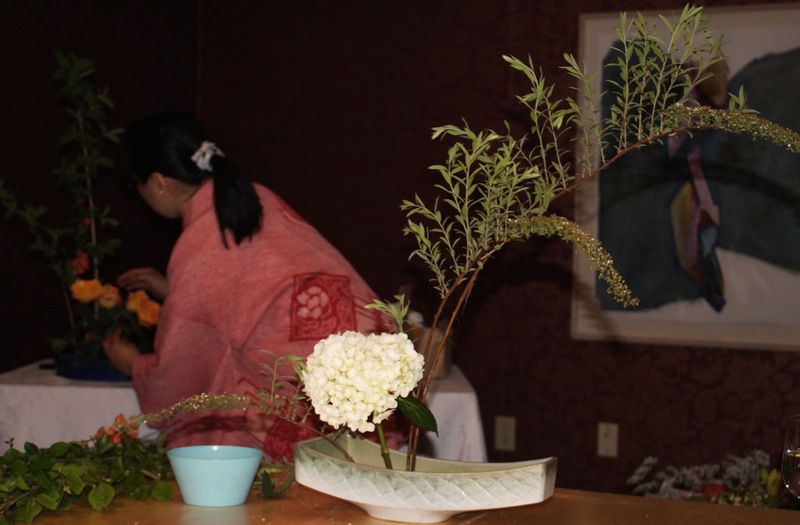 Ikebana is the art of Japanese floral arrangement. I love the minimalism and balance, though I didn’t quite achieve Miyako’s artistry at the workshop. 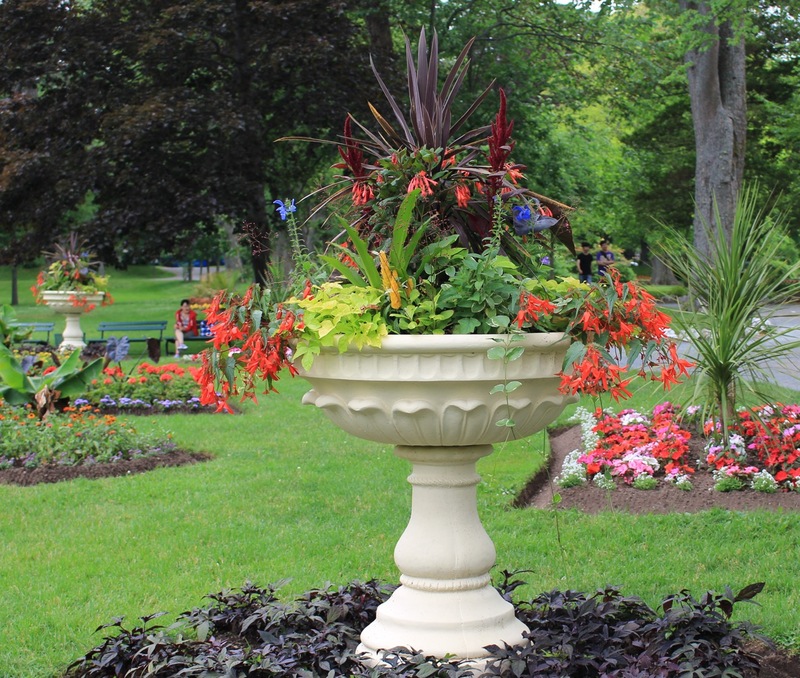 The urns and vases made a comeback looking just like the old ones, though they’re new. Neville MacKay was back entertaining the troupes and creating beautiful arrangements in honour of Dahlia Day. 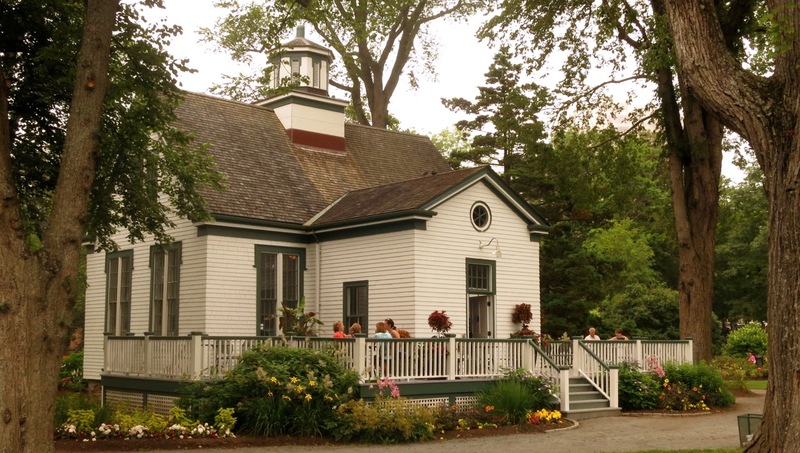 And the troupes came back to be entertained and be educated by the volunteers of the NS Dahlia society. If I say it often enough maybe it’ll come true. I vote the Uncommon Grounds cafe as the best outdoor patio in the city. The Coast are you listening??? A first! Movie Night at the Gardens. Actually any night at the Gardens. 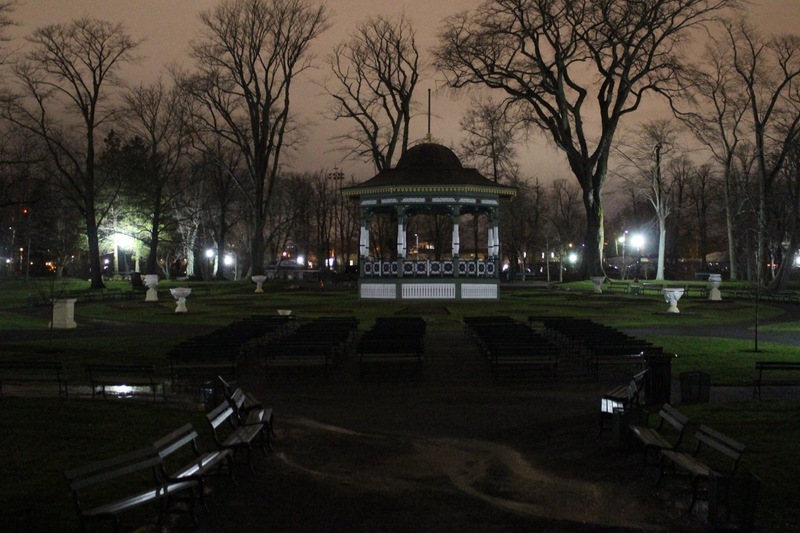 People love being in the Gardens at night. This year you could enjoy it on Nocturne Art at Night, two Movie Nights and the Solstice celebration. Well done whoever thought these up. Kudos to you. The wonderful Hausmusik who make our celebrations more celebratory. 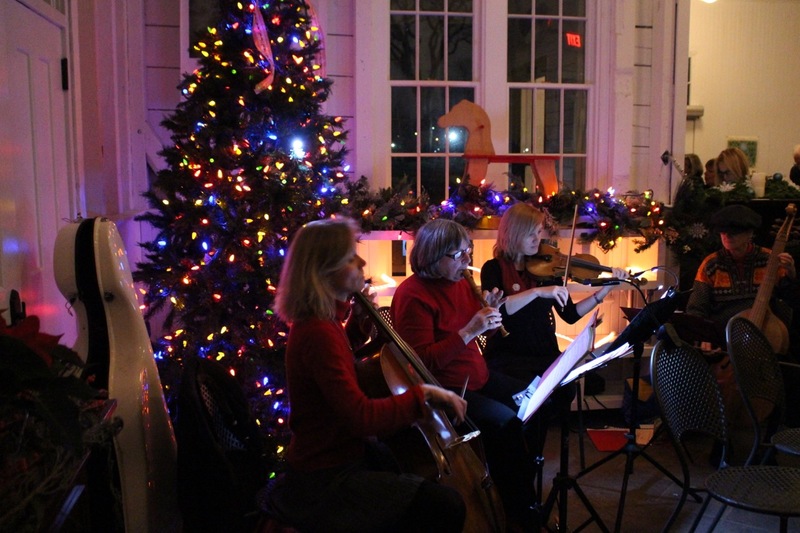 This quartet provided beautiful music during TFPG Holiday Celebration at Horticultural Hall (as well as the Victoria Day Tea). The place was decorated, warm, there was wine, music, food and good company. Who could ask for anything more. Brought to you by … the Horticultural staff clearly enjoy each other’s company and it shows in their work. 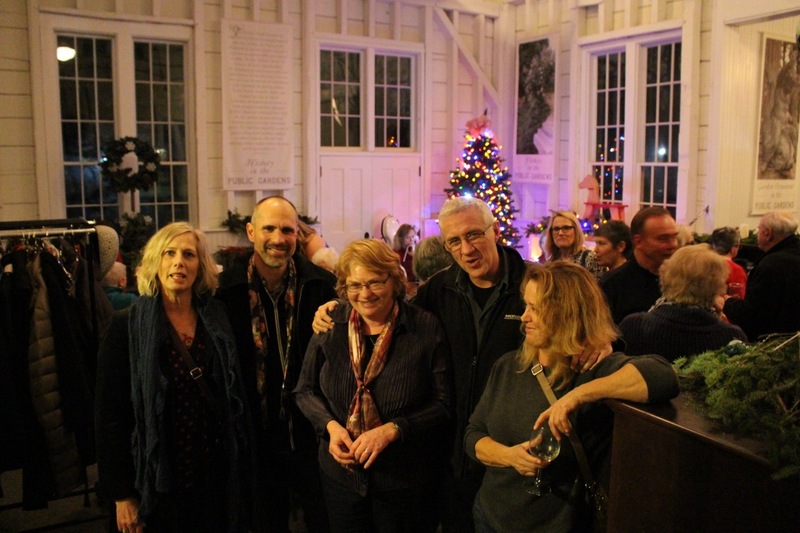 Laurie, Sheldon, Bev, John and Heidi (and the rest of the people not pictured here who make the Gardens rock… I mean grow), thank you all. You do a great job and you’re nice people to boot. 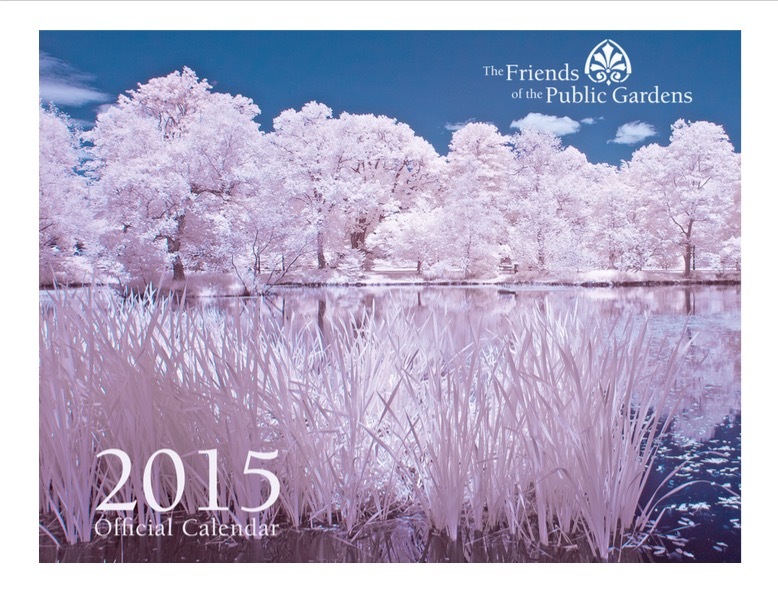 The Friends published the first official calendar of photographs of the Public Gardens taken by local photographers. Thank you for donating your photos for the cause. Public Gardens lovers come in many guises. If you’d like to purchase a calendar you can still do so online. 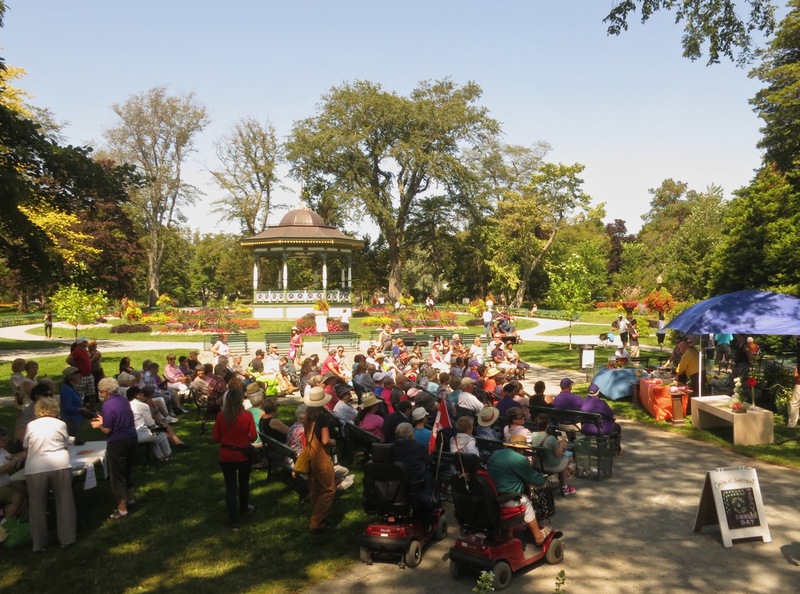 In short 2014, was the year that the Gardens became a social butterfly. There were too many activities and events to mention here, but for the most part they were well attended and judging from the comments on social media and elsewhere, much appreciated. 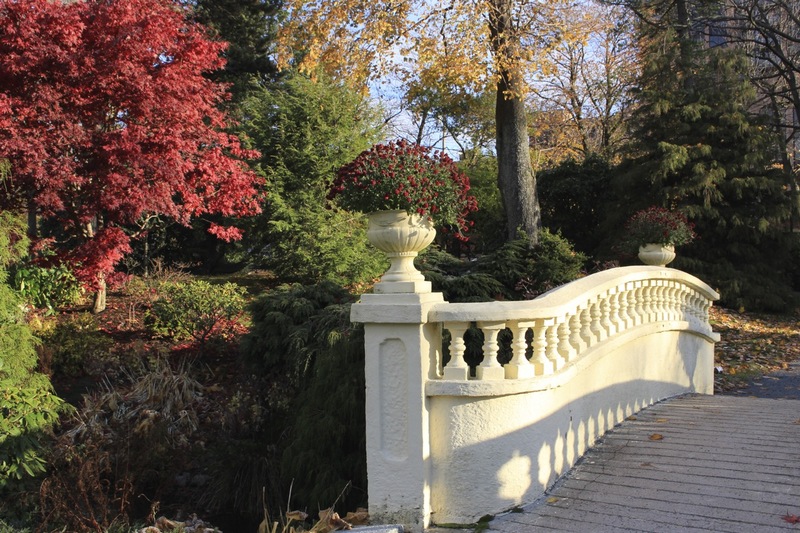 No major projects were undertaken, though I suspect once a new Chief Horticulturist has been selected things will pick up steam again and the continual work of guiding and maintaining a centuries old garden will begin anew. Gardens are like people. The older we get, the more maintenance we require to keep things running smoothly. These are not the aspects of the Gardens that the public notices, until it’s so glaring that you can’t help but notice. If we learnt anything from Hurricane Juan, it was not to take this precious element of our city for granted. All copy and images copyright © Serena Graham-Dwyer, 2014.The calendar photo was taken by Darryl Robertson. If you wish to use any part or whole of an image, in any manner, please contact us. 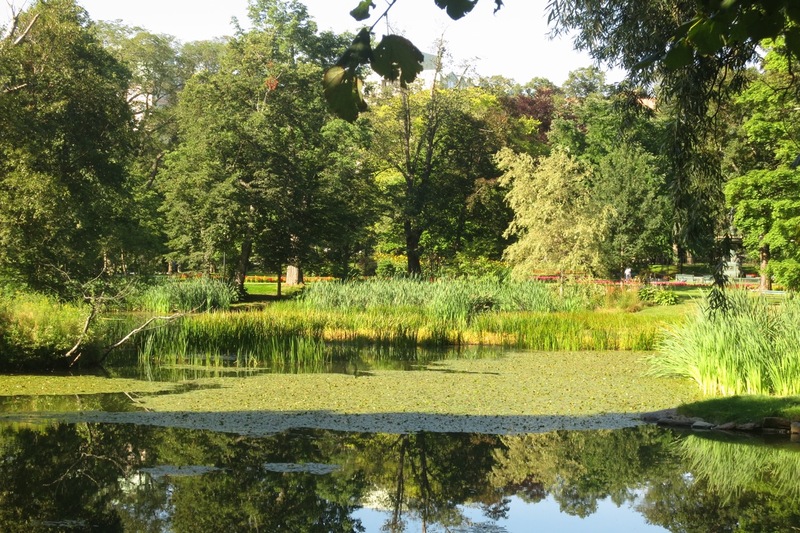 This entry was posted in Halifax Public Gardens, photo tour and tagged and upper bridge., dahlia, gardeners, Griffin's pond, Halifax public gardens, Nocturne Art at Night, Prince Charles, uncommon grounds by friendsblog5665. Bookmark the permalink.